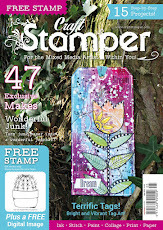 This week we learn more about the the wonderful Elusive Images stamp company who are kindly sponsoring our competition this year with an awesome selection of their gorgeous products. Elusive Images is a very popular UK-based manufacturer and distributor of quality rubber stamps with a distinctive, elegant style as well as the Artylicious line of CDs and papers. The company is run by Glenda and Adrian Waterworth and has been trading for 10 years. Glenda also runs Graphicus which supplies Elusive Images stamps and a huge range of other stamping products directly to the public. I asked Glenda to tell us a little bit more about her companies and their products. What are your product specialisms? Elusive Images rubber stamps, most stamping accessories (ink pads, embossing powders, etc.) Artylicious CDs, Copic Markers, Stampbord, and lots more besides. What are you most proud of in terms of your business? We're very proud of our customer service. We have a lot of very happy customers who keep on coming back to us as their first port of call for their stamping and paper-crafting needs, so we work hard to make sure that we continue to get things right and provide all of our customers, both old and new, with first-rate service. We're also proud of our in-house design and craft expertise – most of our staff members are accomplished artists and crafters in their own right. Our unique selling points include the specific ranges of products that we carry – particularly with regard to our own designs (Elusive Images stamps, Artylicious CDs) – and the Graphicus Guild, which does offer special deals and discounts to members, but which is really focussed on education, artistic enjoyment and creative inspiration. It's hard to choose a greatest achievement – on the business side we've been asked to give presentations to other small business owners and to university business schools, while on the artistic side we have had several pieces published in magazines over the years and I have also contributed artwork to books. However, we would probably say that our greatest achievements have actually been through some of our customers whose creativity we have helped to develop and who have not only become talented crafters themselves, but they have also become friends to all of us here through regular attendance at our open days and other events. Do you run classes, crops, demos or open days? We have a regular programme of classes and workshops, taught by our own staff and by external tutors. We also run a regular crop and our open days are always well attended – they take place every two or three months and run over two full days (Friday and Saturday), usually with at least four or five different demo stations manned throughout both days and often with special guest demonstrators in attendance. Do you have a design team? What drives you in business? Although any business has to make money to survive and grow, the principal driver behind Graphicus and Elusive Images has always been creative freedom. That's not only our own creative freedom, in terms of our own designs and artwork, but also the creative freedom of our customers. We don't just want to provide the products that people need, but also the inspiration to help them release their inner artist and develop their creative abilities. That's why we like it so much when we regularly see that happening at our workshops and open days. 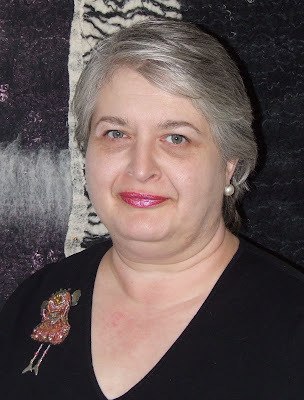 Come back tomorrow for a fascinating interview with Glenda Waterworth. 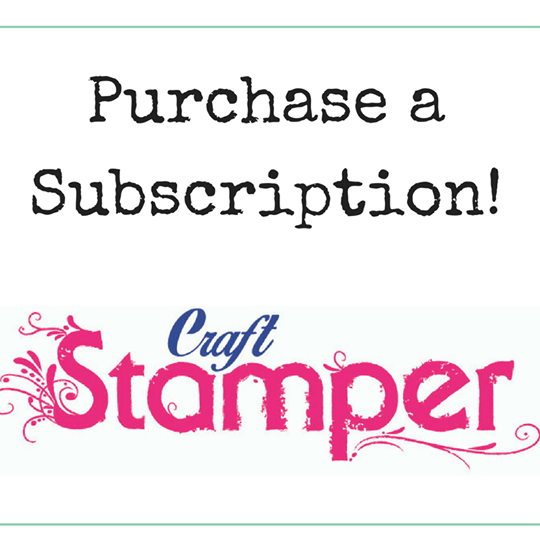 This year I've been asked to demonstrate on the Craft Stamper stand at the Artisan show and I've roped in mag regular Helen Chilton to help me out too! 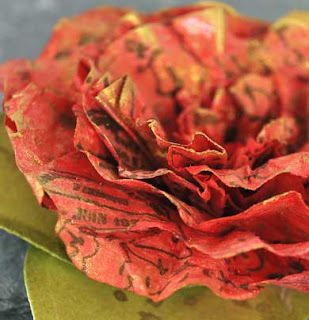 I'll be demonstrating how to make these fabulous grungy 3D flowers using our SHOW EXCLUSIVE subs gift from PaperArtsy. These impactful flowers are very easy and very cheap to make! There will be demos throughout Fri and Sat from myself and Helen, and also from the Beads & Beyond team. If you are not familar with the Artisan show, it's a relatively new show (in its second year) and it is a specialist stamping and beading show in Leamington Spa. The show takes place on Fri and Sat the 1st and 2nd October. More info, including an exhibtor list, can be found on their website. If you visit the show do pop along and say 'hi' - i'll either be demonstating or milling around the show trying very hard not to buy stuff!!! One of four sponsors for our main winner category this year is Crafty Notions, who have provided a fantastic prize stuffed with amazing goodies. 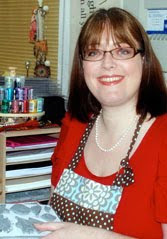 Craftynotions is owned by Sarah Lawrence (pictured) - you might well recognise Sarah as she is often to be found demoing at craft shows around the UK. Craftynotions.com was first registered in 1999 making this company one of the more established online traders in the UK. Crafty They also have premises in Newark, Nottinghamshire and although they don't run a shop as such visitors are always welcome by appointment. "We have a wide range covering textile arts (feltmaking, embroidery) through altered arts to the paper arts and cardmaking. We try to provide products that are that little bit different or special. Absolutely everyhing that we sell has to be approved by Sarah who is a passionate advocate of crafting and has an uncanny ability to see the potential in a way that most of us miss." "We are especially proud of the products that we have developed - our Creative Colour Sprays and the new Colourful Thoughts ranges of paints, micas and embossing enamels - and of course, our gilding flakes." Do you run classes or open days? Do you attend shows regularly? "We run classes from our site in Newark Nottinghamshire. We always have rolling demos at the shows we attend and an open weekend at the beginning of July. We are planning a one-day event in November aimed more at the textile side of things." Sarah also has a blog which she manages to squeeze into her hectic schedule! Her blog can be seen here.